If you drive to Dubrovnik, chances are you'll be coming by the coastal road that stretches north to the Peljesac peninsula and Split and south to Montenegro. (see a road map of Dalmatia) The winding coastal road is extremely scenic (if hair-raising at times) but there is a new motorway under construction that will avoid all the hairpin turns. Although scheduled to be completed around 2008 the project has bogged down in a territorial dispute with Bosnia-Hercegovina. There are plans to construct a bridge from the Croatian mainland to Peljesac peninsula to avoid the need to pass through B-H but completion is a few years away. From Split, it should take you about 3 1/2 hours to Dubrovnik. Note that the road to Dubrovnik passes through Neum which is part of Bosnian territory. You may be asked for your passport, so keep it handy but if you have legally entered Croatia without a visa you are not expected to have a visa to pass through Neum. 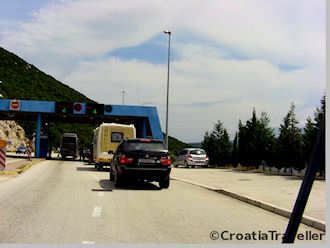 You also do not need a cross-border card for insurance purposes to drive through Neum. The police will not check your insurance papers. Driving to Zagreb is a long haul. Either you backtrack along the coast to Split where you can take the motorway (7 hours driving time) or you drive up through Bosnia-Hercegovina and enter Croatia from the east to take a highway from Osijek to Zagreb (8 hours driving time) . It's quicker and not much more expensive to take a flight from Dubrovnik to Zagreb. See flights to Dubrovnik and my driving distance chart for road distances from Dubrovnik to other Croatian cities. But Hvar is an island! Here's what you do: drive to Sucuraj on Hvar's southeastern tip and take the ferry to Drvenik on the mainland (see the Drvenik-Sucuraj ferry schedule). Then drive down to Dubrovnik. You can make it in about four hours. Here's what you do: take the ferry from Korcula to Orebic. Then drive down the Peljesac Peninsula to Dubrovnik. You can make it in about two hours. It's an easy drive from Kotor to Dubrovnik--less than 1 1/2 hours. Naturally, in summer it will take longer because of waiting at the border.